When in season, there is one menu item we can guarantee will fly out of our restaurants: Cajun Gator Tail. It’s a customer favorite here at Razzoo’s, and yet, many don’t know much about this delicacy of Cajun cuisine. So here ya go: a few fun facts you didn’t know about Razzoo’s famous Cajun gator tail! 1. Alligator Isn’t Raised for its Meat. Not sure why, because this stuff is good eatin’, but it’s not. The primary purpose: skin for fancy boots. The meat is simply a by-product. And when the economy tanks, so does our availability of delicious gator tail. 2. Even with Sky High Prices – Gator Tail Sells Out. Speaking of the economy tanking, back in 2008, the recession hit and fancy people stopped buying their fancy alligator skin boots. Which meant, less meat for us. All the Cajun restaurants were fighting over the meager supply, and paying a pretty penny for it too. We raised our prices, and it still sold out. We took the fried gator appetizer off of the menu to try to manage supply, and yet, we still sold out. It doesn’t matter what we do – those in the know will pay for the delicious taste of Cajun gator tail! 3. Fried Gator Tail is an Insider Secret. Wait what? Razzoo’s has a Fried Gator Tail appetizer? While not an official menu item, insiders know and love this beloved dish. So much so, that Fried Gator Tail is our #3 more popular menu item at Razzoo’s, trailing only behind our beloved Rat Toes (fried shrimp & crab stuffed jalapenos) and Fried Pickles. The moral of the story: if you haven’t given the Fried Gator Tail at Razzoo’s Cajun restaurant in Texas a try, then you need to add it to your bucket list right away. So what are you waiting for?! 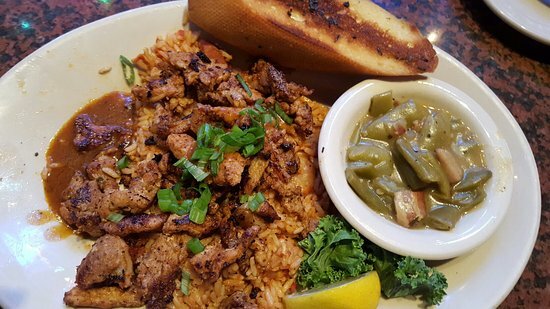 Head on over to a Razzoo’s Cajun Café near you and do what the regulars do, order the Cajun Gator Tail!